As I mentioned in my last post I have another autumnal card to share with you. I was tidying up my desk when I noticed the design on my tissue box and thought I’d like to recreate it in card form and this is what I came up with. What I love about this card is that it has such an unexpected colour combination considering the main images on it are leaves, but I really like how it looks. The card base is Sahara Sand and is layered with Night of Navy and some more Sahara Sand. I cut my top layer a little smaller than usual to have a bigger border on my middle layer to help emphasise the difference between the layers. The flourish from Timeless Textures (love this stamp set) in Smoky Slate stamped off once created a subtle background and the leaves from Vintage Leaves were stamped in Night of Navy. My biggest dilemma was finding the right finishing touch for my card and after lots of experimenting I think I found it. I stamped the lace image from Grateful Bunch in full strength Smoky Slate on a strip of Sahara Sand cardstock (I ended up trimming it again afterwards to have the image right at the top), the smallest pearls and a touch of clear Wink of Stella on the bow part of the lace were just what I was wanting. The sentiment is from Grateful Bunch and the border is from Rose Wonder, cut out with the matching thinlits, both are in Night of Navy on Sahara Sand and popped up on dimensionals. The inside is simply finished with the same cardstock layers and the lace pattern repeated twice in Smoky Slate. I think this would make a lovely sympathy card but decided to use another sentiment that (to my mind anyway) created a bit of a quirky mix with the classical styling of this card. I do hope you like this version of Vintage Leaves, I’ve been having a lovely time playing with this stamp set and framelits and I know I’ve used them heaps but I really like to get my moneys worth out of my product and the more versatile a set is the more value it is to my mind and I hope I’ve been able to show that here. 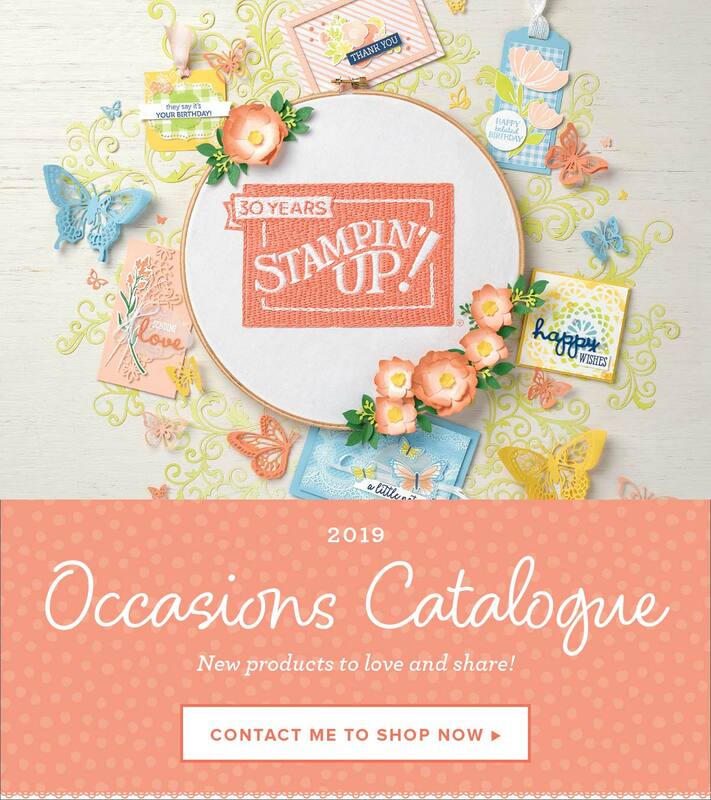 If you would like to purchase any of the items used in todays’ card please visit my online store, I’d love to be your demonstrator and if you have any questions about Stampin’ Up! products please contact me.